Coastal and island tide-gauge data show that sea level rose by just under 20 cm between 1870 and 2001, with an average rise of 1.7 mm per year during the 20th century and with an increase in the rate of rise over this period. This is consistent with the geological data and the few long records of sea level from coastal tide gauges. 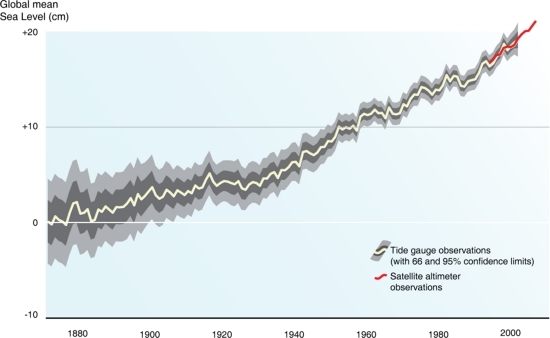 From 1993 to the end of 2006, near-global measurements of sea level (between 65°N and 65°S) made by high precision satellite altimeters indicate global average sea level has been rising at 3.1 ± 0.4 mm per year.